Schneeberger Linear Technology Introduces the MINISCALE PLUS 0.1 Micron Integrated Encoder System Cost and installation of an external distance measuring system are not required MINISCALE PLUS is ready to measure out-of-the-box Woburn, Massachusetts, August 30, 2018 – Schneeberger Linear Technology, a world leader in linear motion and positioning systems has released the MINISCALE PLUS 0.1 micron resolution integrated encoder system for the full range of MINIRAIL products. MINISCALE PLUS can be used for all carriage lengths and all rails from 7mm to 42mm in width. 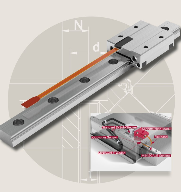 The sensor of the MINISCALE PLUS is mounted flush to the top of the guideway carriages and does not impede the mechanical installation of the system. Reduced installation times mean more profitability for our customers and with the ability to laser etch the encoder scale the full length of the rail, we are able to maximize the measurement area up to a full meter. MINISCALE PLUS as a single assembly is makes its measurements at the payload as part of normal operation which significantly reduces the chance of Abbe errors. It is also able to measure at the MINIRAIL maximum acceleration of 30g and maximum speed of 5 meters/second. Both Digital and Analog outputs are available. For more information send an inquiry directly to Schneeberger Inc.